To read the first post in this series of my “weekend in Nantucket” recaps, check it out here! Enjoy this second installment! By the time my husband and I disembarked in Nantucket, it was about 4:30 and we were both starving for a small snack. After we dropped off our luggage at the hotel, we made our way back to the area where we docked. 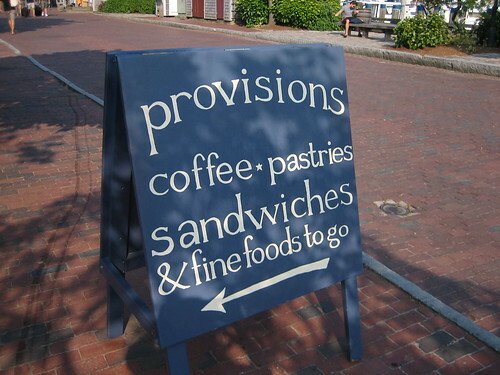 Based on some quick research, we decided to head to Provisions, a small cafe that serves up freshly made sandwiches, coffee, pastries and other small snacks. My husband was craving a small sandwich to tide him over until dinner (don’t you love how guys can eat a whole sandwich as a pre-dinner snack? ), and based on our quick internet consulting, Provisions was apparently the place to go! As most restaurants and cafes in Nantucket are, Provisions is basically located in an old-looking, weathered house, giving it that classic Nantucket charm! 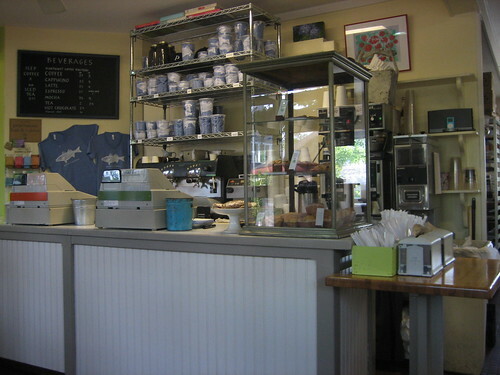 There were two counters at this small cafe– one for coffee and pastries and one to order made-to-order sandwiches and salads. Here’s a shot of the coffee counter. . .
although we headed straight to the sandwich counter! From the chalkboard menu, my husband ordered a BLT on ciabatta– you basically place your order and pick it up when you are done. There are a decent number of tables in Provisions itself, one of which we grabbed for ourselves, but many order their food for takeout, perhaps to eat on a ferry ride back home! While I didn’t order anything and just snacked on a Larabar myself, as far as vegan options go, they did have a hummus and veggie sandwich, as well as a sweet potato, roasted broccoli salad with a ginger sesame vinaigrette that peaked my gluten-free vegan tastebuds! Provisions is a popular place, and now we see why. It was fast, easy and convenient, but the food is far from fast food. My husband’s sandwich was freshly made, piping hot with quality ingredients– he proclaimed it the best sandwich he has had in a long time! A few hours after this snack though, dinnertime finally rolled around. We knew we wanted to eat outdoors in a casual spot that was busy and near all of the hustle and bustle of the ferry landing for some good people-watching. We decided to dine at The Tavern– a huge waterfront restaurant with a very chill vibe, complete with two floors of outdoor seating and a gazebo bar! A quick glance of the menu while walking by revealed it did serve two things I was craving– french fries and a fruity, nutty salad. It has a great atmosphere, as it is open, airy, and has plenty of nice outdoor seating to watch people come and go off fo the ferry. We were offered a seat outdoors on the ground floor or second floor balcony. To the balcony we went! Our table provided us with a wonderful view! 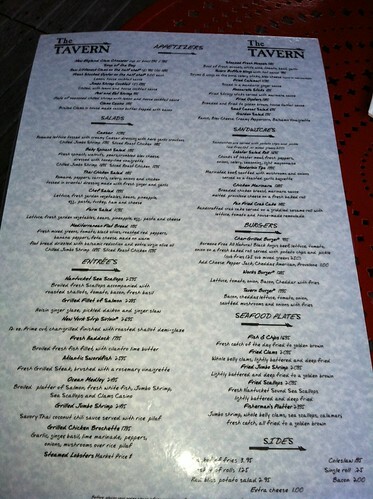 The menu is large, filled with mostly seafood offerings, with a whole section reserved for deep-fried seafood platters! Definitely not a fine dining establishment, but I still had high hopes that my food would be good. For a Friday night, it wasn’t that busy, probably because it was early in the tourist season, so we had a lot attention from the waitstaff. 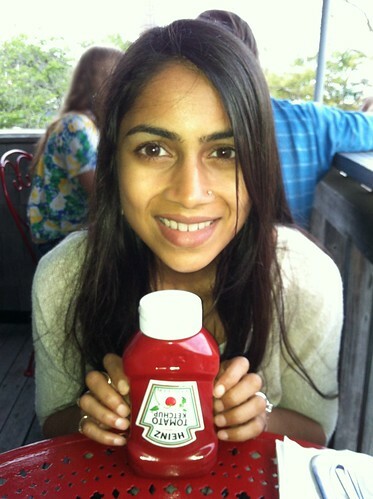 We placed our orders quickly, and the waitress so thoughtfully brought out a bottle of ketchup right away for my fries. Any place that brings the ketchup before the order arrives really earns my respect– I hate having to hunt down a ketchup bottle after my order already is on the table. 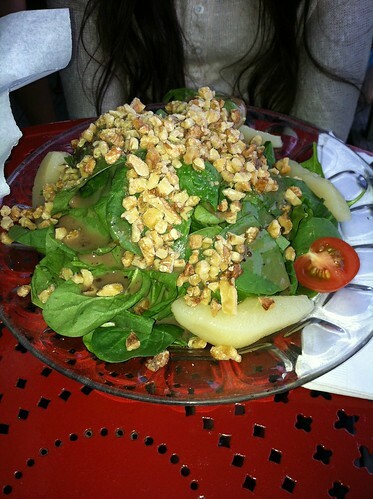 I ordered their spinach salad, consisting of baby spinach, walnuts, bleu cheese (which I had left off), pears, and a honey-lime vinaigrette. I asked for no cheese of course, and extra pears and walnuts for more sustenance. When my salad arrived, I instantly was disappointed. First, it was basically all spinach– I love me a good bunch of greens, but essentially that was all this salad was. Second, I asked for extra pears and I don’t think four pear slivers constitutes extra pears at all. I do think they added a generous sprinkle of walnuts. Finally, the worst part about this salad? THE PEARS WERE CLEARLY CANNED! How gross! I am sorry, but canned pears are sort of disgusting in my book– mushy and tasteless and way too syrupy sweet. I mean, come on, it can’t be too hard to use fresh pears! I also had to ask for extra dressing since the mound of spinach needed some additional flavor. While I ate it all, it was definitely a salad fail. 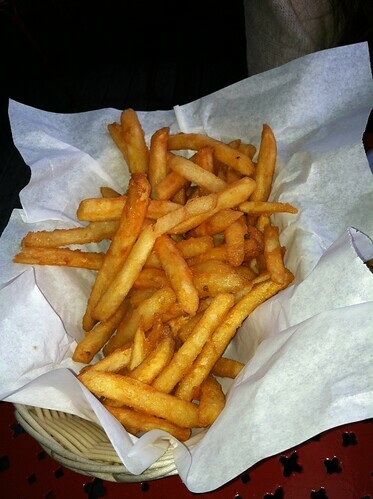 The fries were at least decent to average though! My husband ordered a fried scallop plate that came with fries, which he thought tasted funny. The scallops themselves he thought were fine, but nothing special. 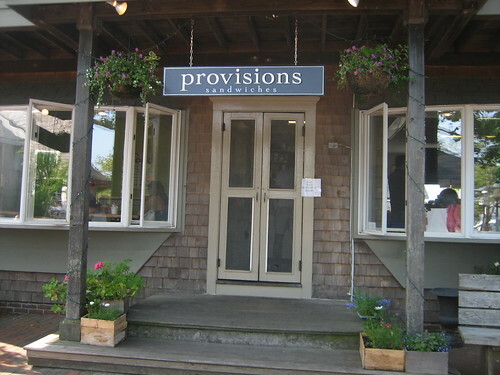 Bottom line, in you are in Nantucket and need a quick lunch or snack, go to Provisions. If you want a good meal, don’t go to the Tavern. 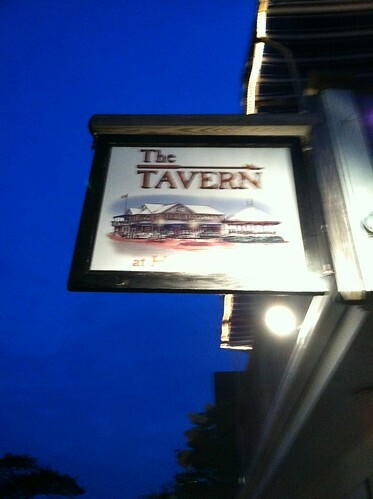 If you want mediocre food but a great casual people-watching vibe, then by all means hit up the Tavern by the water! 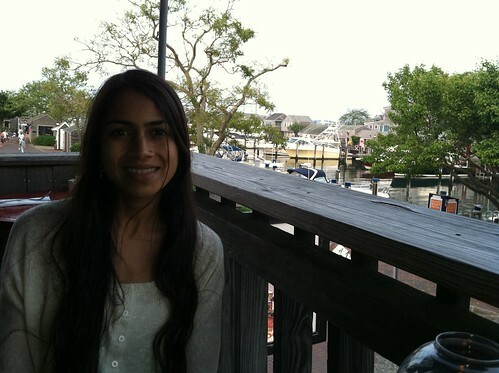 Though my food was terrible, I definitely would return just for the fact it is a nice place to relax and catch some of the Nantucket action. Do you ever frequent places for the vibe, despite the fact the food stinks?